Anneke Jans is a neighborhood bistro with a NY city feel, where old and new friends gather to enjoy delicious food and drink good wine from our extensive list. Our menu changes often, and the parking is easy. The Black Trumpet Bistro is a chef-owned bistro-and-wine bar in a 200-year-old building of brick and beams. The menu changes often, drawing inspiration from the country cuisine of the Mediterranean. Located on quiet and quaint Commercial Alley in the heart of Portsmouth, Cava Tapas & Wine Bar offers fresh and innovative small-plate fare and a diverse and always changing selection of international wines in two wine bars -- one on street level and one in the "wine cave." Clay Hill Farm is an award-winning restaurant and wedding venue on 11 sprawling acres. With beautiful garden paths and protected woodlands, the restaurant is the first in the country to be a certified wildlife habitat, bird sanctuary and state Environmental Leader property. Cocktail deck and weekly dining specials. NEW! Outside Dining on the Deck (In-season) Live Entertainment-Experiential Dining. Voted #1 for weddings and romantic dining. 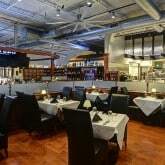 Discover the new definition of steakhouse, with all-natural chops, local fresh seafood, casual bar fare and the largest selection of bottled wines on the Seacoast, all in a warm, contemporary atmosphere. The Dockside has the best view of York Harbor. A beautiful setting inside and out. The big mahogany bar and outdoor patio bar offer cocktails and lite fare, while our warm and comfortable dining room serves contemporary Maine cuisine for lunch and dinner. Facilities for private groups up to 160. Mombo's dining experience is an escape from it all, offering creative cuisine with international influences and warm hospitality. Sit beside the fireplace, at the open kitchen bar, or next to the bubbling patio fountain. The Oar House serves seafood, poultry, beef and other specialties in an historic maritime setting in downtown Portsmouth. When you want great food with selections to please everyone in your party AND ambiance beyond compare, think of Stage Neck Inn. The Inn's cliff-top setting and grand ocean, beach and river views complement the creative cuisine and friendly service. Experience the finest cuts of prime and choice steaks and chops, fresh seafood and outstanding service in one of the most beautifully preserved historic buildings in New England. Two-Fifty Market is a one of a kind dining experience located in the Sheraton Portsmouth Harborside Hotel inspired by local ingredients and the culinary expertise of our acclaimed chef. Recognized by Food & Wine Magazine. Fresh local seafood including, of course, lobster. The elegant dining experience is enriched with a continental flair, veal, beef and chicken dishes complemented by incomparable sauces. Oceanview formal dining room. plus casual fare in the Ship's Cellar Pub.